My trip report is coming along slowly due to a bunch of other things on today’s agenda, but I should have something by tomorrow. It was a great trip and we did try a few very good restaurants. I finally made it to Chelsea Market too, but I’ll talk about that later. For now, here’s today’s cookie. I felt like making something this morning, but we had very little food in the house and I needed a recipe which called for the basics. Chocolate Crackle Cookies to the rescue! This is one recipe you can always fall back on. It also happens to be one of C&H sugar’s most requested. I did add one twist. Since I had a bag of Hershey’s cinnamon chips, I used cinnamon chips instead of walnuts. Given how delicious the combination of cinnamon chips and chocolate was, I’d do it again. Here’s C&H’s recipe, but with a twist for those who like cinnamon. 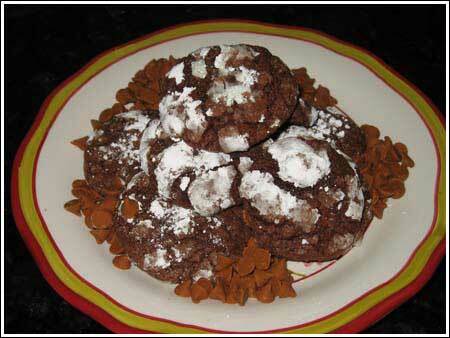 A very good recipe for chocolate crackle cookies, only this one calls for Hershey's Cinnamon Chips. For a more traditional cookie, use regular semisweet or dark chocolate chips. With electric mixer beat chocolate, oil and sugar until blended. Beat in eggs, one at a time until incorporated. Add vanilla. Combine flour, baking powder and salt; stir into sugar mixture. Stir in cinnamon chips. Chill for about 1 hour or until firm enough to roll into balls. Shape dough into rounded teaspoonful size balls (about an inch in diameter) then roll in powdered sugar. Place on non-stick cookie sheet. Bake 10 to 12 minutes. Cool on rack. I order cinnamon chips in bags through King Arthur Flour’s website. If you love to bake (which I’m assuming you all do), they have other great stuff to buy along with the chips! Lots of all natural and whole grain products. I found them at H.E.B. which is a local grocery store. If you can’t find them, you might have to order them off Amazon. Where did you find the cinnamon chips? I used to find them at Wegmans, but they have now disappeared off the shelves and I can’t find them in any other grocery store in the DC area! By the way, these freeze great.